In pre-1858 England wills were probated through the Church of England, generally where the ancestor lived and held property. Probate records were church records. Within the Church of England there are a number of courts in which a will could have been probated: a Peculiar Court, an Archdeacon's Court, a Bishop's Court, and an Archbishop's Court, among others. An executor would generally have taken the will to the lowest court with jurisdiction over the area where the will could have been probated. The first step to finding probate records for an ancestor who lived in England is to learn where he lived and held property. Census records, a death record, and a burial record can all help you determine that location. The National Archives (U.K.) has an excellent online guide to assist and direct in searching for pre-1858 probate records. You can find it at Wills and probate before 1858: further research. In the book A Genealogist's Guide to Discovering Your English Ancestors by Paul Milner and Linda Jonas there is a chapter devoted to searching for pre-1858 probate records. It explains the church court system (parish, peculiar, deanery, etc.) and suggests the steps to follow to search for records. This is especially helpful because there may be several courts' records one needs to search, each successively higher and geographically broader. 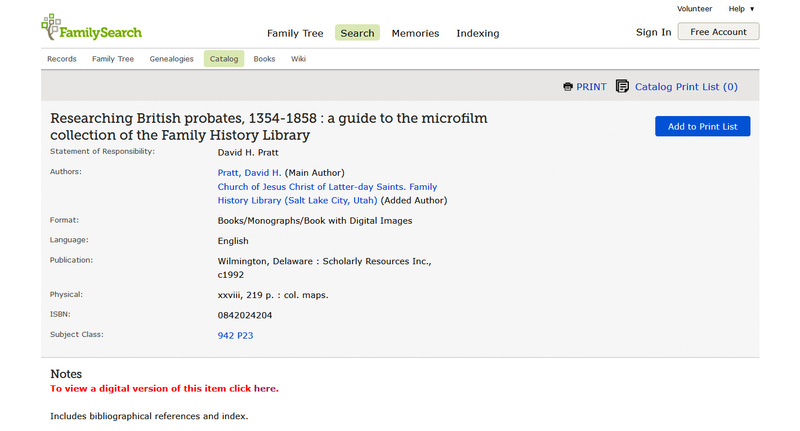 In addition, there is a section devoted to finding and using probate indexes. 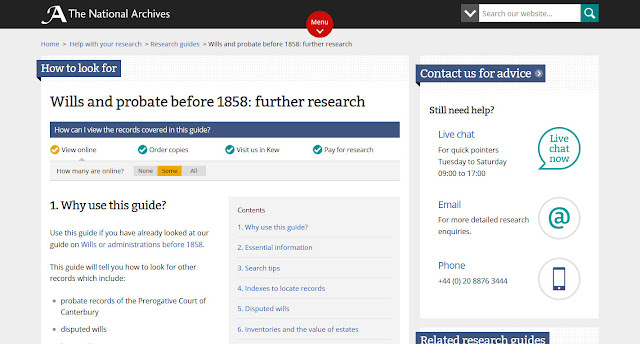 FamilySearch has a book devoted to researching British probate records before 1858. 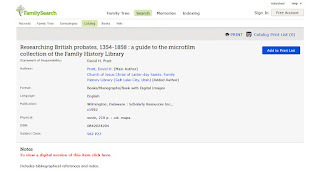 Information is available at Researching British probates, 1354-1858 : a guide to the microfilm collection of the Family History Library. There is link to digital images which can be viewed at local Family History Center or at the Family History Library in Salt Lake City. While you're at the FamilySearch website (and after you've found where your ancestor may have owned property and died), be sure to search the catalog by location to see lists of probate records available for that location at FamilySearch. The Northumberland Probate Records wiki at FamilySearch offers a step-by-step guide to searching records. 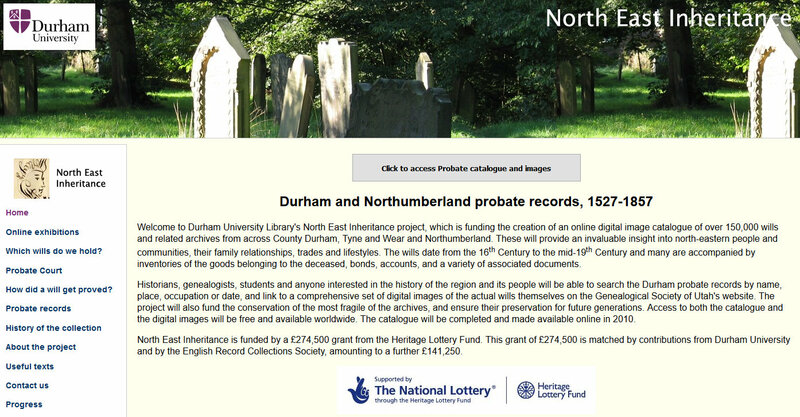 Durham and Northumberland Probate Records, 1527-1857 is a website offered by Durham University Library. It is searchable by name and also offers an advanced search. I believe this is a work in progress based on the explanation in the opening paragraph and is a website I will search again in the future. 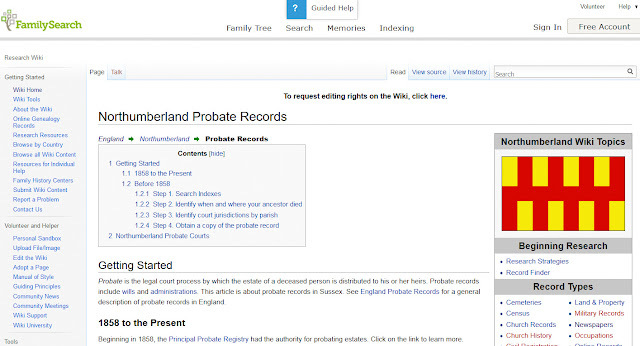 English Probate Jurisdictions -- Northumberland is pamphlet offered through FamilySearch with a step-by-step guide for searching. You may need to sign in to FamilySearch to see this website. (It will look like a blank screen so be sure to scroll down.) This is a guide through the court system -- search here first, here second, etc. Letters of administration and probates granted, ca. 1832-1893 for Northumberland and Durham gives information about a FamilySearch microfilm (#252774 / #004629095) which is available for digital viewing here (possibly after you sign in to your FamilySearch account or it may be available only at a Family History Center). The images are not yet indexed. Have you had success in finding early English probate records for an ancestor? Do you have any tips or hints for my readers and me?